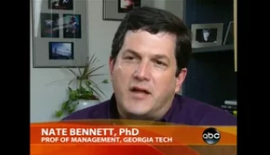 Nate Bennett, Ph.D., is the Associate Dean for Faculty and Research, the faculty director of the EMBA program, and a professor in the J. Mack Robinson College of Business at Georgia State University. Over the years, he has won numerous awards for his teaching. He is co-author (with Stephen Miles) of two Stanford University Press books, “Riding Shotgun: The Role of the COO” and “Your Career Game: How Game Theory Can Help You Achieve Your Professional Goals.” For 8 years, he served as the academic advisor to the COO Circle, a group Chief Operating Officers from the world’s largest companies and most impactful non-profits. 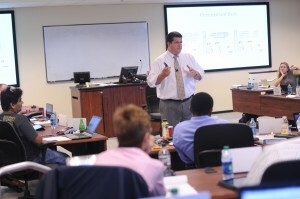 Nate Bennett joined the faculty of the J. Mack Robinson College of Business at Georgia State University in the summer of 2012. 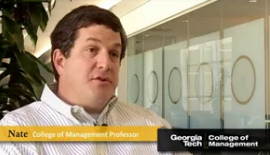 From 1999 to 2012, he served as the Catherine W. and Edwin A. Wahlen Professor of Management, as well as in a number of leadership roles, at Georgia Tech. 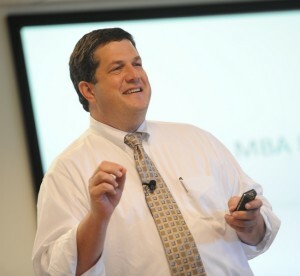 He has published in many widely read resources for managers including the Harvard Business Review, Wall Street Journal, BusinessWeek.com and Forbes.com. 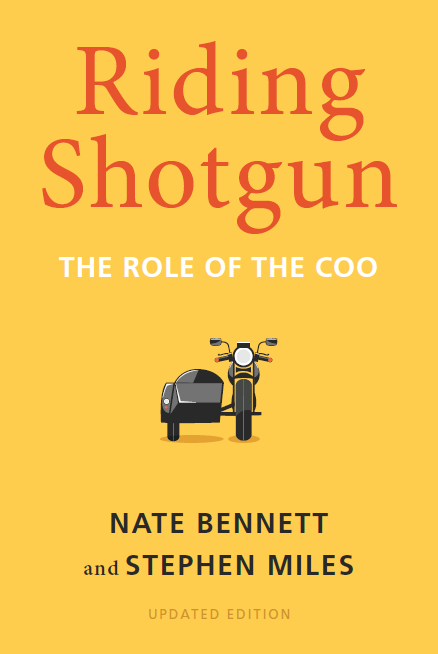 He is co-author of two books, “Riding Shotgun: The Role of the COO” and “Your Career Game: How Game Theory Can Help You Achieve Your Professional Goals.” Both are books published by Stanford University Press. Additionally, his research has been published in the Academy of Management Review, the Academy of Management Journal, and the Journal of Applied Psychology, as well as other academic outlets. His current research interests involve power, leadership selection and development, top management team effectiveness and leadership transitions. Nate can be reached by email to nate@gsu.edu. 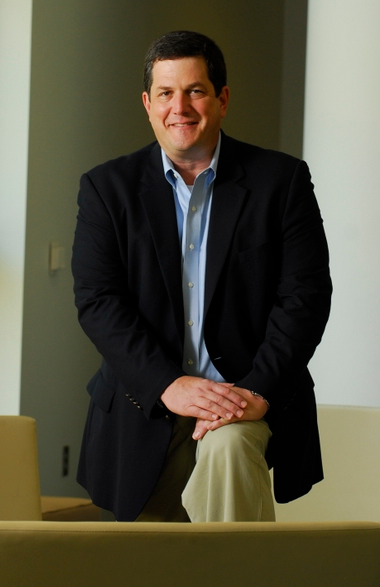 Nate has more than 25 years of experience designing and delivering highly customized and impactful executive education programs for companies in a wide range of industries. He has worked with audiences gathered in locations across North America, Europe, and South America. 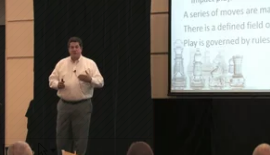 He is known as an engaging presenter with a very interactive style and practical approach and he works carefully to make sure executives leave programs with new skills that can immediately be put to use. 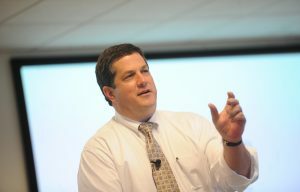 In addition to his work in programs with Georgia State University, the Georgia Institute of Technology, and Louisiana State University, he has been invited to serve as a faculty member in programs offered by the University of North Carolina-Chapel Hill’s Kenan-Flagler School of Business and the University of Minnesota’s Carlson School of Management. He has been invited to lecture in programs for executives hosted at the Moscow Institute of Physics and Technology in Russia, Institut Commercial de Nancy in France, and Instituto Tecnologico de Buenos Aires in Argentina. Clients include: Schneider Electric, The Coca Cola Company, Delta Air Lines, McGladrey, GEICO, UnitedHealth Group, CHS, Lockheed-Martin, GE, St. Jude Medical, Schlumberger, McKesson, and NCR. Your style is unlike any others’ and it was a pleasure for me to be part of your class! He did a great job of keeping everyone engaged – great sense of humor. Dr. Bennett was a fantastic speaker and facilitator – he made the subject matter interesting. He was very good at making everyone’s input fit and matter. Very engaging presentation – kept it real and relevant. Nate is very insightful and knowledgeable. Nate was very well prepared and able to show how the concepts he was teaching would help us at (our company). Bennett, N. (2017). “Feedback: A Gift You Can’t Return“. Saporta Report, October 2. Bennett, N. (2017). “Waffle House, Hash Browns and Leadership“. Atlanta Business Chronicle, November 3. Miles, S.A., & Bennett, N. (2017). “Startups and COOs: When and How?“. Entrepreneur Magazine, May 25. Bennett, N., & Bedwell, M. (2017). “Arguing the Case for a Lawyer as COO“. Law360. May 12. Bennett, N., & Miles, S.A. (2017). “Re-Inventing Yourself as COO“. European Business Review, January. Bennett, N. (2016). “Leaders Are Made, Not Born: Here’s How“. Forbes, November 3. Bennett, N., & Lemoine, G.J. (2016). “The Essential Leadership Challenge for 2016 is Overcoming VUCA“. Atlanta Business Chronicle, January 5. Bennett, N. (2016). “Leaders Are Made, Not Born — Here’s How To Make Them (Like Fine Wine!)“. Forbes, November 3. Bennett, N. (2015). “Our Leader Left. Who is Left to Lead? The Chronicle of Higher Education, Opinion/Editorial Section“, July 22 (web) August 7 (print). Bennett, N. (2015). “Why Should Anyone Lead You?“. Saporta Report, April 27. Bennett, N., & Parks, J.M. (2015). “Resolutions for Leading a More Innovative Company in 2015“. Atlanta Business Chronicle, January 16. Bennett, N. (2015). Resolved for 2015: “Invest in your Portable Capabilities“. Saporta Report, January 5. Bennett, N. (2014). “Reputation is Still King. 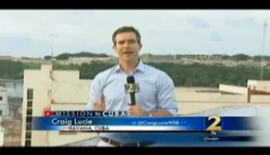 Saporta Report“, August 27. Miles, S.A., & Bennett, N. (2014). “Getting the Board on its Toes: Anticipate the Threats to CEO Succession“. PREA Quarterly, Summer. Bennett, N., & Shill, W. (2014). “The Dangers in Letting COOs Become an Endangered Species“. Directors and Boards, Summer. Bennett, N., & Forquer, D.R. (2014). “What America’s Cup Taught about Turnarounds“. Harvard Business Review, blogs.hbr.org, April 9. Bennett, N. (2014). “Is a Winning Culture the Chicken or the Egg?“ Atlanta Business Chronicle, March 21. Bennett, N., & Griffin, T. (2014). “Don’t Skimp on Talent Management in a Downturn“. SaportaReport.com. Robinson College of Business, March 7. Bennett, N., & Miles, S. (2014). “Who Is Looking Out for No. 1?“. SaportaReport.com. Robinson College of Business, February 17. Bennett, N., & Lemoine, G. (2014). 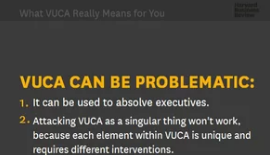 “What VUCA Really Means for You”. HBR.org Reprint F1401C Idea Watch, January-February. Bennett, N. (2013). “Are Your Change Leaders Managing Traffic?” Bloomberg Business Week, October 10. Dill, K. (2013). “Lululemon Wants You To Know It Still Has A Sense Of Humor. But Should It Be Laughing?“. Forbes.com, June 13. Bennett, N., & McMahon, B. (2013). “What Baseball Teaches About Leading When Expectations Are High or Failure Is Certain“.Business Week, March 28. Miles, S.A., & Bennett, N. (2013). “March Madness Leadership Lessons“. Business Week, March 13. Miles, S.A., & Bennett, N. (2012). “Leadership Advice for the New York Times and its New CEO“. Business Week, November 21. Miles, S.A., & Bennett, N. (2012). “The Hidden Cost of the Citi Succession“. Business Week, October 31. Bennett, N., & Miles, S.A. (2012). “Is Your Board About to Pick the Wrong CEO?“. Boardmember/NYSE Euronext, October 11. Miles, S.A., & Bennett, N. (2012). “NFL Fans Get the ‘Stakeholder’ Treatment in Ref Dispute“. Business Week, September 26. Bennett, N., Miles, S.A., & Shill, W. (2012). “The Disappearing COO and the Evaporating Talent Pool“. Business Week, September 10. Miles, S.A., & Bennett, N. (2012). “Systematic Shocks: Does Your Leader Absorb Them or Make Them Worse?“ Business Week, September 4. Bennett, N., Miles, S.A., & McMahon, B. (2011). “Managing the Millennials“. Talent Management, June. Bennett, N., & Miles, S.A. (2010). “Business Decisions are Like Golf Decisions“. Forbes.com, March 24. Miles, S.A. & Bennett, N. (2009). “How the SEC Just Changed Succession Planning, I“. Forbes.com, November 17. Miles, S.A. & Bennett, N. (2009). “How the SEC Just Changed Succession Planning, II“. Forbes.com, November 18. Miles, S.A. & Bennett, N. (2009). “Is your CEO Recession-Capable?“ Business Week online, January 9. Miles, S.A. & Bennett, N. (2009). “The Changing Employer-Employee Relationship“. Business Week online, March 31. We compete for jobs: the more desirable the job, the tougher the competition. Most people readily understand this. But, fewer people recognize that the pursuit of an open job can be framed as one “move” in a multifaceted game called “a career.” Individuals who see the career game for what it is- a fascinating, complex, nuanced, real-life, multiplayer maze that unfolds in real time-can develop into better players. Those who do have a better chance of successfully competing for the positions that will enable them to realize their goals. The role of Chief Operations Officer is clearly important. In fact, it has been argued that the number two position is the toughest job in a company. COOs are typically the key individuals responsible for the delivery of results on a day-to-day, quarter-to-quarter basis. They play a critical leadership role in executing the strategies developed by the top management team. And, in many cases, they are being groomed to be—or are actually being tested as—the firm’s CEO-elect. Despite all this, the COO role has not received much attention. Send your comments, questions or inquiries regarding recent speaking engagements, or personal notes by using the form below. In addition to your inquiry you will receive Nate’s latest news and updates.